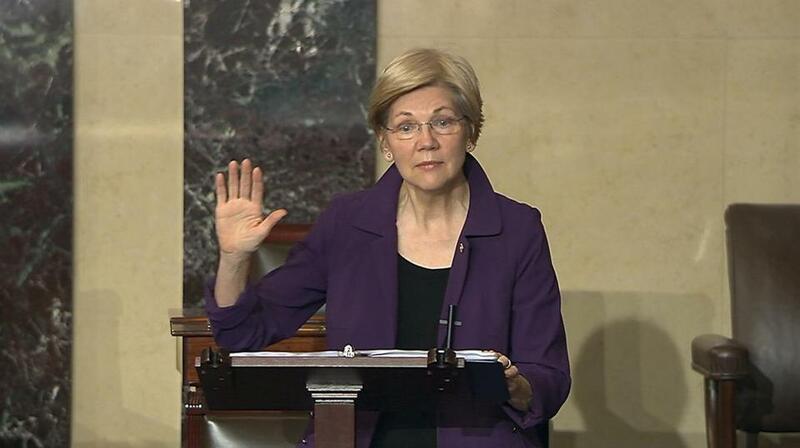 Senator Elizabeth Warren of Massachusetts. A new poll shows that, while Republican President Donald J. Trump’s fledgling administration has hit rough waters, he would still beat Democratic US Senator Elizabeth Warren of Massachusetts. The POLITICO/Morning Consult poll found that he would beat her, 42 percent to 36 percent, in a hypothetical matchup, politico.com reported. Twenty-two percent said they didn’t know or had no opinion. The poll found that a generic Democrat would do better, garnering 43 percent of the votes in 2020, compared with 35 percent for Trump. Thirty-seven percent had a very favorable or somewhat favorable view of Warren, while 30 percent had a somewhat unfavorable or very unavorable view of her. The rest either had not heard of her or had no opinion, the poll found. The survey, which asked a host of other questions, was conducted last Thursday and Friday. That was after Warren gained attention when she was silenced in the Senate for criticizing then-attorney general nominee Jeff Sessions. But it was before this week’s resignation of Trump’s national security adviser and new revelations about Russian contacts with the Trump campaign. The poll of 1,791 registered voters had a margin of error of plus or minus two points.